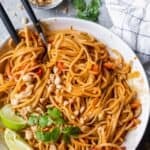 This is an Asian Noodle Salad where all the hype is not about the noodles but the spicy creamy peanut dressing I make with it. It’s a simple salad that you can make ahead of time. Actually, I recommend that you make it ahead of time! Basically it’s noodles drenched in said dressing and tossed with crunchy colorful vegetables. 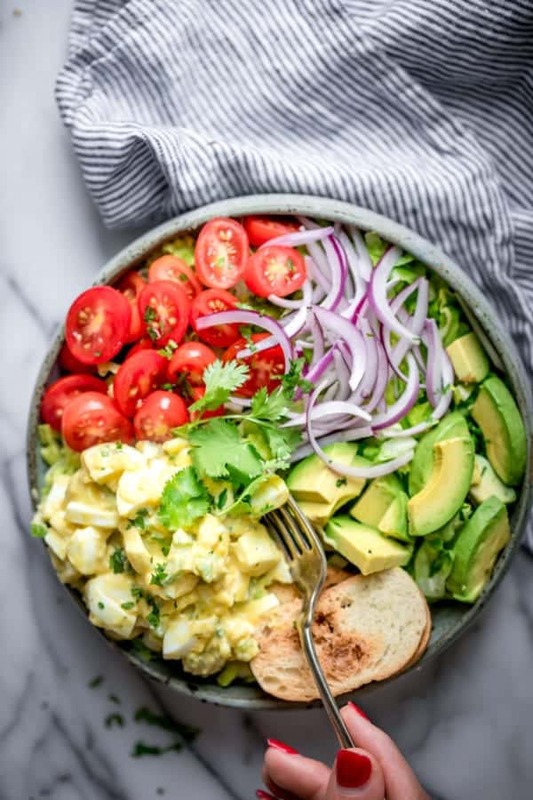 This is the type of salad you can really have as a full meal for lunch or dinner. Best part is that it’s gluten-free since it’s made with rice noodles, and it’s totally vegan! There are three steps to the salad: 1) prepare the vegetables, 2) prepare the noodles 3) prepare the dressing. Each step will take you about 5 minutes. So it all comes together pretty effortlessly and quickly. For the vegetables, I use red peppers and carrots. Sometimes I’ll even add red cabbage, sugar snap peas or broccoli. 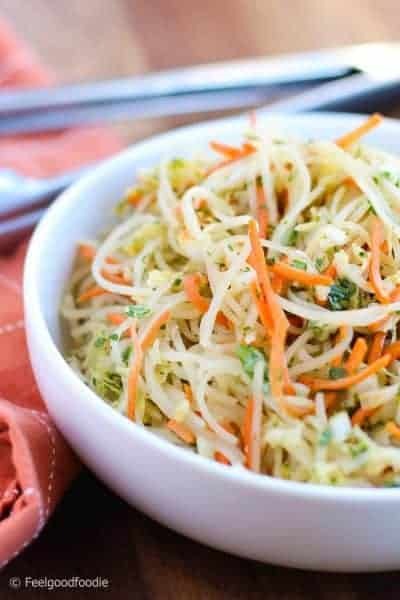 I recommend cutting them julienne style if you can or spiralizing whatever vegetables you can because it creates a great presentation that way! 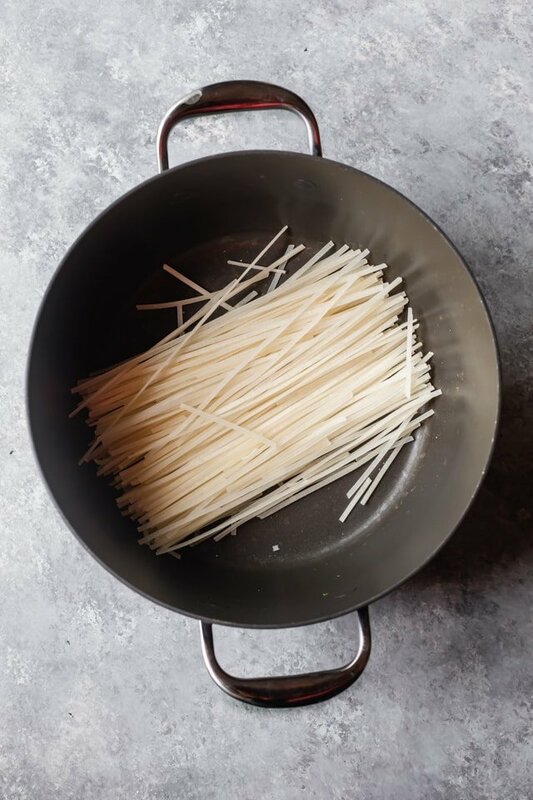 For the noodles, you can really use any noodles you’d like, including soba noodles, buckwheat noodles or even spaghetti and linguine. I usually go to the Asian section of the grocery store and look for stir fry noodles. Most of them are rice based and the only ingredients are rice flour and water. That’s the kind I picked for this Asian noodle salad. That’s because it’s gluten-free so it makes the meal feel lighter. Also, its texture absorbs the dressing really well without make it mushy. 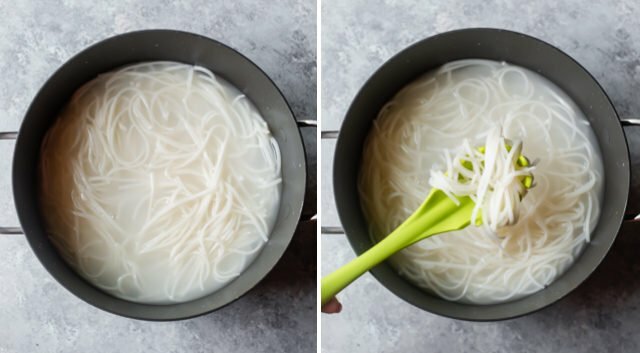 The cool thing about these rice noodles is you can place them in a pot of large bowl, soak them in boiling water and just let them sit without any heat for a few minutes until the texture gets soft. The boiling water alone cooks them. I recommend stirring frequently though to make sure the noodles don’t get stuck together. To make the dressing, it’s common ingredients you’d find in Asian stir-fries, but the vinegar plays an important role in giving it a tangy taste to make the dressing. I also use peanut butter to make it thicker and give it a creamy nutty taste. The other ingredients are soy sauce, sriracha, olive oil, ginger, garlic, and sugar (optional). You can whisk everything together. But I prefer using a tiny blender to crush the garlic and ginger and get all their flavors incorporated. You may want to double up on that dressing because you can use it as a marinade for chicken, fish or beef later in the week, or make more Asian Noodle Salad! When all three parts of the recipe are prepped, it’s time to toss everything together. You may find that the amount of sauce it too much for the noodles. Or you might be like me and find it just perfect because each noodle will literally be drenched in the creamy peanut dressing. And that, to me, is a beautiful thing! I love how each ingredient in the dressing plays an important role in rounding out the flavor and giving it an irresistible taste. I mean really, if nothing else, just make the dressing, you guys! Then, just give it a good toss and taste it. 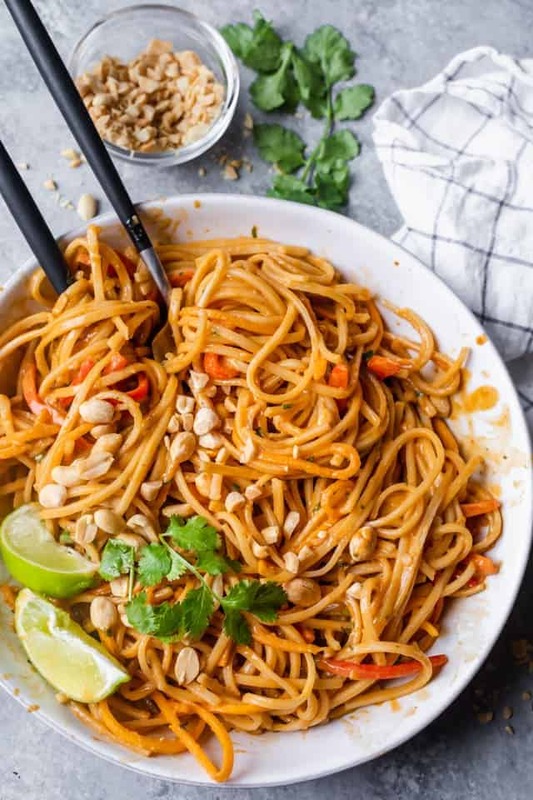 You can make it more salty by adding more soy sauce, more nutty by scooping in more peanut butter, or more spicy by bumping up that sriracha. Don’t rinse the rice noodles, or any other noodles you use, with cold water after they cook. That’s because the warm pasta will better absorb the dressing much better than cold rinsed pasta will. Actually this is a great tip for any pasta salad you make! Allow the salad time to settle for best flavor. The cool thing about the noodles we’re using is that they don’t get soggy but continue to absorb the flavor of the dressing and taste better after settling. That makes this salad perfect for lunches, picnics or potlucks. No need to take dressing with you! Add moisture back into the salad after 3-4 days by saving some of the dressing for later. Or you can whisk together rice vinegar and soy sauce to add moisture back into the salad if it gets dry. 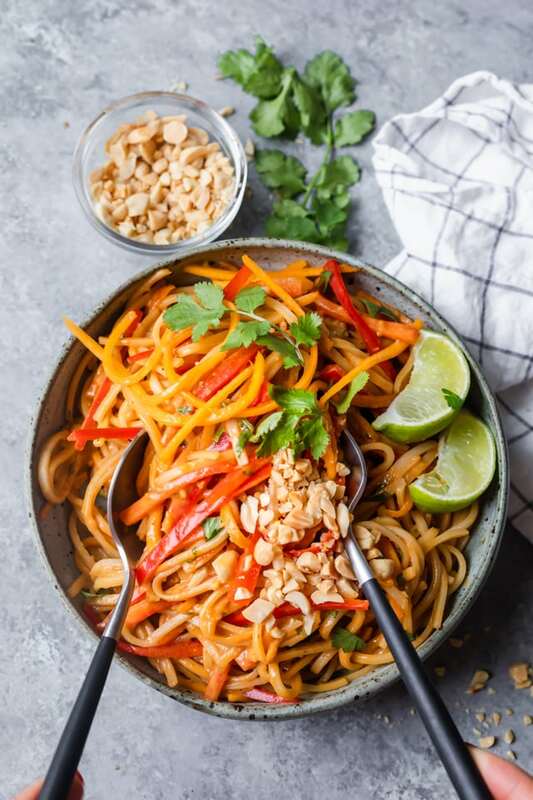 This gluten-free vegan Asian Noodle Salad with the Asian-inspired dressing is such a delicious meal that’s full of color, flavor and nutrition. I haven’t found anyone who doesn’t enjoy eating the salad when I make it. 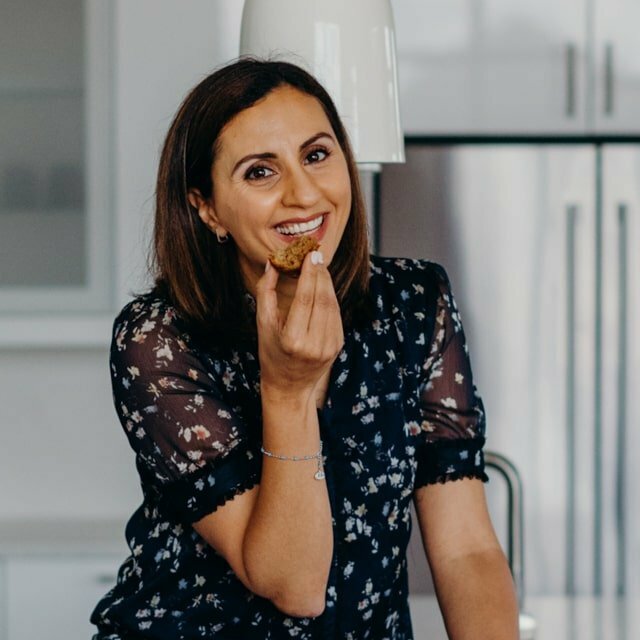 And I love that it’s versatile so you can use any noodles you’d like, any vegetables you’d like and even throw on some protein of your choice to make it an even more filling meal. 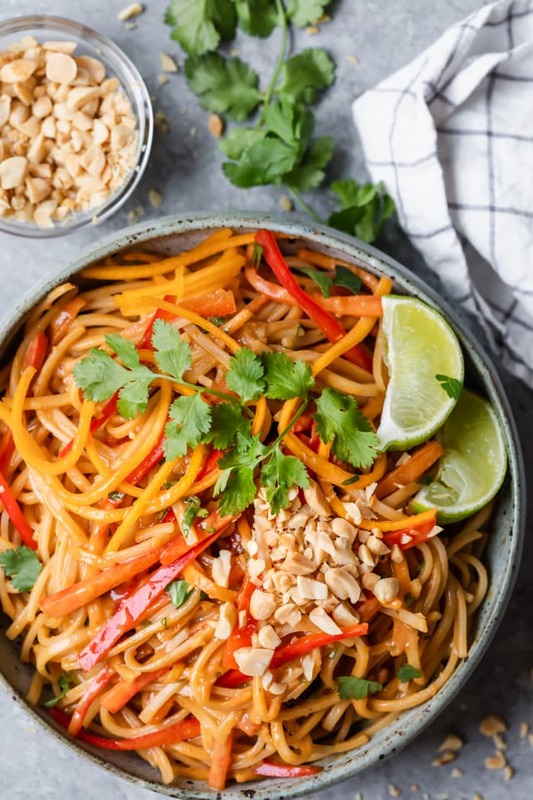 If you’ve tried this healthy-ish feel good Asian Noodle Salad recipe or any other recipe on FeelGoodFoodie, then don’t forget to rate the recipe and leave me a comment below! I would love to hear about your experience making it. And if you snapped some shots of it, share it with me on Instagram so I can repost on my stories! I created this blog post first on May 11, 2017. I am updating it today to include improved new step-by-step images and a video tutorial! Cook rice noodles according to package instructions. 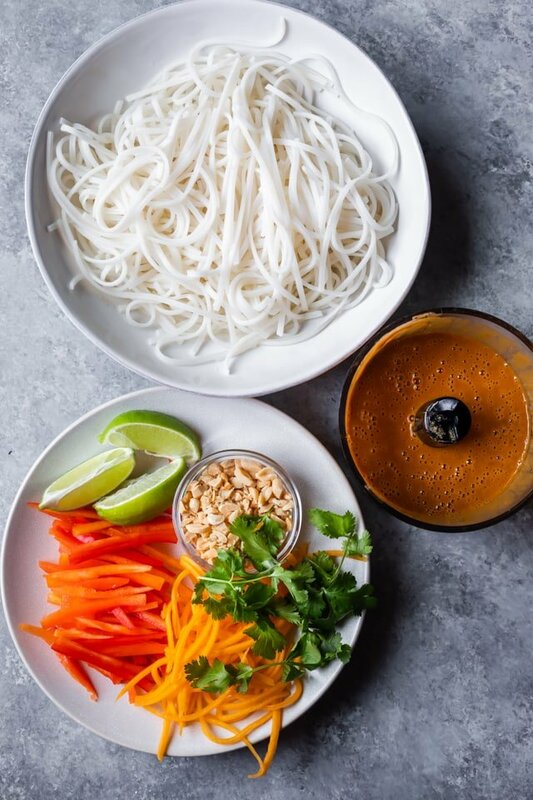 Most brands of rice noodles only require the rice noodles be placed in boiling water for 5 minutes and stirred a couple times. Drain the pasta and rinse with cold water. 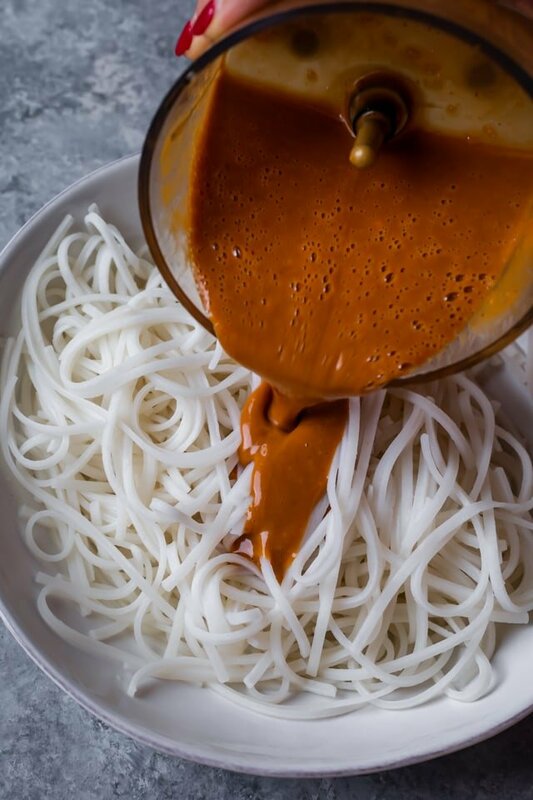 While the rice noodles cook, pour the Tamari sauce, rice vinegar, peanut butter, olive oil, Sriracha sauce, cane sugar, ginger and garlic into a small blender or food processor to make the dressing. Transfer the cooked noodles to a large bowl. 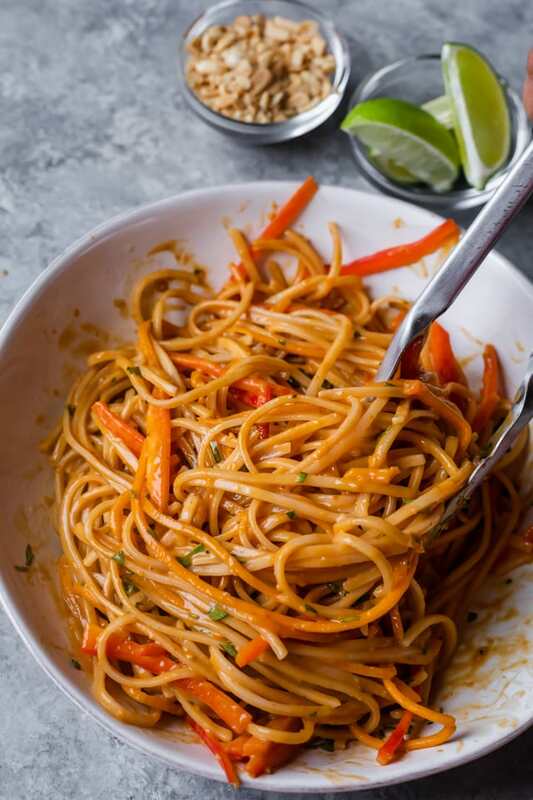 Then add the spiralized carrots, red peppers and cilantro to the cooked noodles. Pour the dressing over the rice noodles and vegetables, and toss to combine. 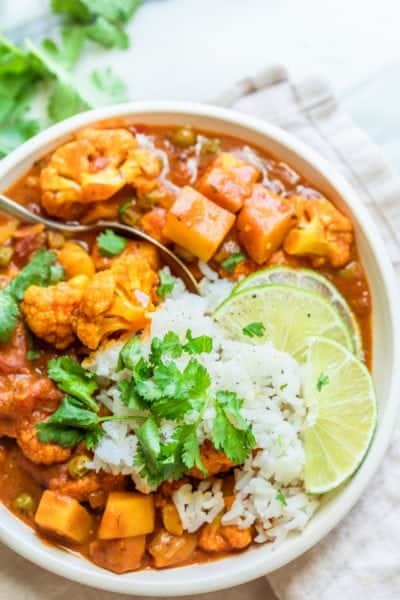 Serve with roasted peanuts, chopped green onions, fresh cilantro and lime wedges, if desired. 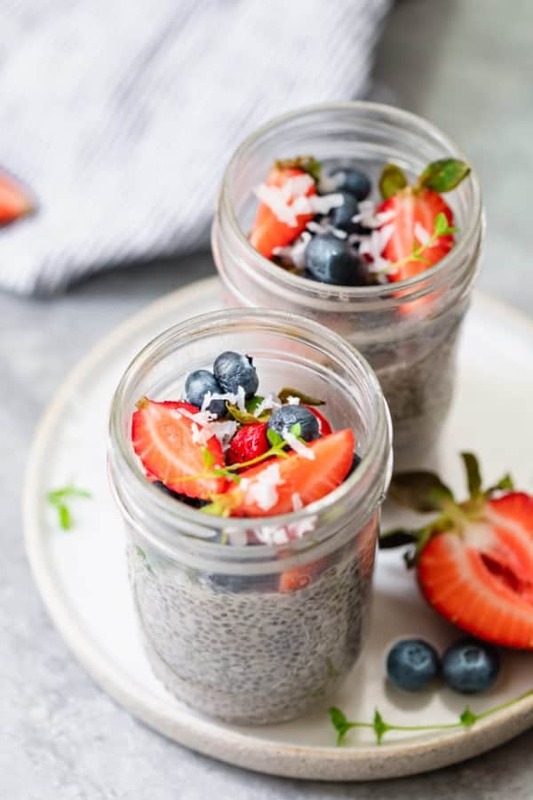 Storage: Store any leftovers in an airtight container. 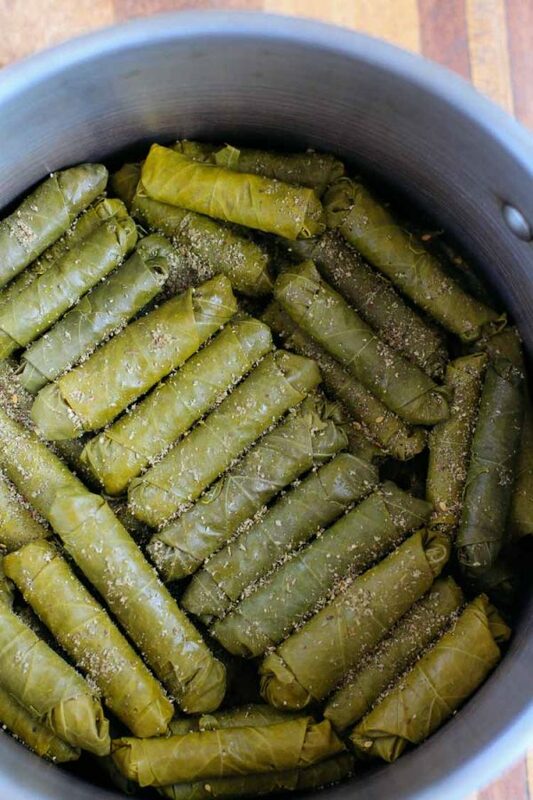 They will last about 3-4 days in the fridge. And because I used rice noodles, they actually hold their structure well for a few days even after tossed in the dressing. Make Ahead Tips: You can make the dressing a day in advance or up to 30 days in advance actually, and have it ready to go in the fridge. Substitutes: For best results, follow the recipe as is. However you can use any noodles of choice and vegetables of choice. If you don't have rice wine vinegar, you can use lemon or lime juice instead. Equipment: I love using my Cuisinart Smart Stick hand blender for blending dressings, especially when I use garlic or ginger in the dressing. 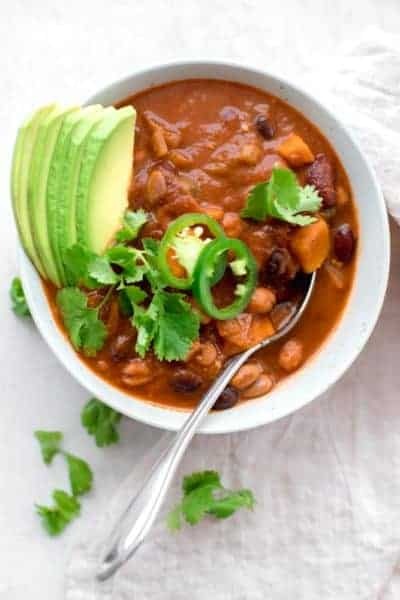 It's quick and easy and gets me the perfect consistency, without any chunks of garlic or ginger left over. Nutrition: Please note that the nutrition label provided is an estimate based on an online nutrition calculator. It will vary based on the specific ingredients you use. This information should not be considered a substitute for a professional nutritionist’s advice. The nutrition value is for 4 servings. This sounds so good! Just wanted to ask about something, in the tips it says not to rinse the noodles but in the directions it says you should. Which way is best for this dish? Excited to try it! Hi Shannon, sorry for the confusion. In the directions, you’re actually cooking the noodles in boiling water by letting them soak in the water. But I recommend not rinsing them with cold water after you cook and drain the noodles. I’ll clarify that a bit more in the post now. Thanks for bringing that to my attention! Wow this is the real deal! No need for take out anymore, yum! 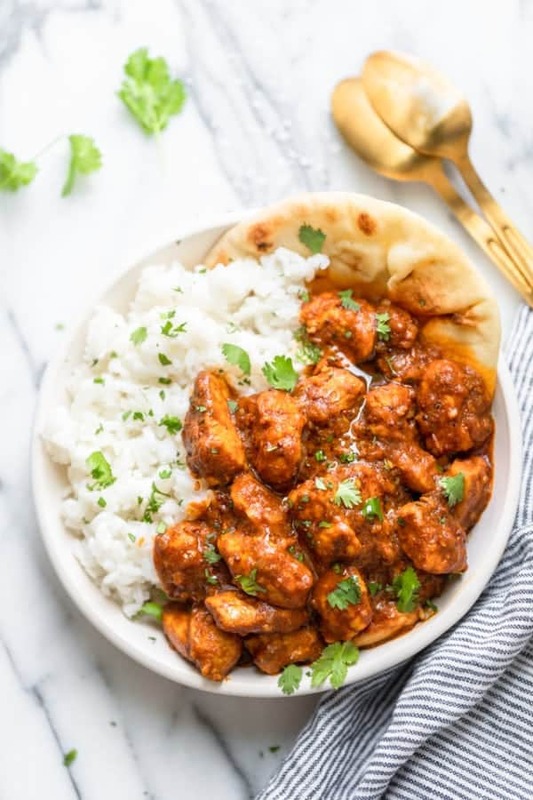 This looks so delicious and comforting, I love the flavor combination! Spicy Asian Noodle recipe….about how many does this serve for a small, appetizer sized portion?